Family Poaceae Barnhart, genue Sorghum (L) Moench. 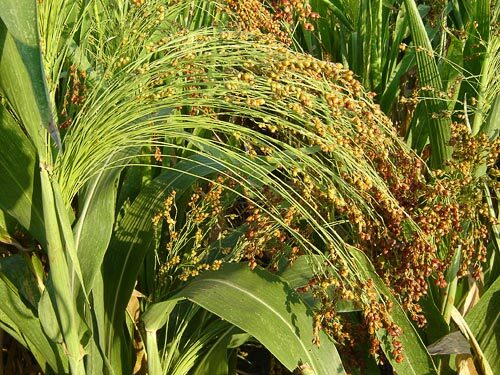 Holcus dochna Forssk., Sorghum bicolor (L.), Moench var. saccharatum (L.), Mohlenbrock. This is an annual, tall, upright plant with clusters. Stalk light green color, 1-3 m tall, 25-30 mm thick; inside is filled with a white, spongy tissue. Root system is fibrillose. Roots spread sideways from the point of tillering up to a distance of 1.5 m horizontally and up to 2-3 m deep. Leaf blade lanceolate (5-8 cm wide), covered with waxen bloom. Leaves are usually drooping, smooth with sharply expressed, main vein. Leaves may be curled in dry weather, reducing the evaporating surface. Inflorescence is a panicle 10-70 cm long, with various forms and coloring. Cross-pollinated plant, but it self-pollinates also. Pollen is transported by wind. Fruit is a weevil. Grain is oval or ovate in shape, husked or bare, white, pink, red or yellow in color. 1000 grains weigh 5-32 g. Chromosome number: 2n=20, 40, 60. It is assumed that the genus Sorgho appeared about 5 thousand years ago in Northeastern Africa (the Ethiopian-Egyptian area). Sorgho has been cultivated in Middle Asia for 2.5-3 thousand years. In Russia, it appeared in the middle of the 19th century. It occupies rather small areas in the former USSR, cumulatively covering over 190 thousand hectares. It is cultivated in Kazakhstan, the Central Asian republics, the Lower Volga region, droughty steppe areas of the Ukraine, Moldova, the Rostov region, Northern Ossetia, Stavropol and Krasnodar regions, Transcaucasia, and the Far East. This is a thermophilic, fruitful, drought-resistant culture. It is a short-day plant. It is tolerant to saline soils; it can withstand heat and dry winds. The optimum temperature for development is 20-25°C. Shoots are sensitive to frosts. It is undemanding on soil. It is cultivated even on saline soils, though it prefers fertile, sufficiently warm, friable, non-boggy soils. Towards the beginning of its development, it grows slowly and does not tolerate field weeds. In drought conditions, it withers (leaves curl; growth stops). The sum of active temperatures must be 2000-4000°C during the vegetative period in order for the plant to reach full maturity. The most widespread varieties include Kinel'skoe 3, Kamyshinskoe 7, Stavropol'skoe 36, Rannij yantar' dneprovskij, Oranzhevoe 160, Kubanskij yantar', Kitajskij yantar' 813, Chernyj yantar', and Medovoe rannee. Food, industrial and fodder culture. It provides raw material for starch- treacle and the brewing industries; the grain in certain varieties serves as a food for people. Grain contains protein (11-15%), starch (68-73%), fat (3.5-4.5%), carotene, B-vitamins, riboflavin and tannins. Flour, groats, spirit, and starch are all made from the grain. Chemical compound of stalks: water - 65.8%, saccharose - 11.25%, other sugars - 2.75%, cellulose - 7.32%, starch - 5.15%, protein - 2.6%, vegetable gum - 3.31%, pectinaceous substances - 0.6%, fat - 0.02%. The grain and green mass are forage for cattle. Plant also contains prussic acid; amount depends on variety. Its contains 500 mg of fodder per kilogram of dry matter, which is critical for animals. Stalks (without leaves and panicles) contain 80-85% juice, which is used for the production of treacle, sugar and ethanol. From dry stalks, anticorrosive means, paper and gum products are derived. Productivity of grain reaches 2.5-5 (10) tons per hectare; of stalks, 22-50 tons per hectare. Andreev N.G. 1989. Meadow and field feed-production. Moscow. Baranov V.D., Ustimenko G.V., ed. 1994. The world of cultural plants. The directory. Moscow. Demidenko B.G. 1957. Sorghum. Moscow. Demidenko B.G. 1984. Creation of new grades and hybrids of Sorgho and a Sudan grass. Stavropol. Golubeva G.S. 1983. Achivments of sorgho growing technologies. Moscow. Lukashev A.A. 1960. Sorgho in Kazakhstan. Alma-Ata. Malinovskij B.N. 1992. Sorgho on the Northern Caucasus. Rostov-na-Donu. Shekun G.M. 1964. Culture Sorgho in the USSR and its biological features. Moscow. Shepel' N.A. 1989. Sorgho - intensive culture. Simferopol. Shorin P.M. 1986. Technology of cultivation and use of Sorgho. Moscow. Shorin P.M., Malinovskij B.N., Miroshnitchenko V.F. 1973. Sorgho is a valuable fodder culture. Moscow. Zhukovskij P.M. 1971. Cultural plants and their relatives. Leningrad.